In the saturated rock reunion climate today, there are precious few revelations left. The Police? Reunited. Pink Floyd? Reunited with Roger Waters, at least for one night. Led Zeppelin? Realigned for a one-off show and very likely a tour if a Rolling Stone cover story portends anything. Are there any surprises left? Well, there is one. David Lee Roth's prodigal son-like return to the Van Halen microphone seemed all but unlikely, after several failed attempts over the years for he and Eddie Van Halen to finally realize the seemingly hopeless dream of many a rock fan. To be fair, perhaps the timing wasn't right until now; the obstacles Eddie's faced in recent years include divorce, rehab and even cancer. Also, anyone familiar with Roth realizes he's a notorious clown and let's face it, the bane of Eddie's existence on a personal and historical level. We all know that Van Halen did not get inducted into the Rock and Roll Hall of Fame this past January on the strength of the Sammy Hagar material. How perverse then, that this unlikely and overwhelmingly successful reunion that touched down in Portland this past Saturday came just a few months too late for the appropriate Van Halen personnel to receive the honor in person; they had to cede the formalities to Hagar and recently-ousted longtime bassist Michael Anthony. But with a catalog this rich and the irresistible Diamond Dave back at center stage, who gives a damn about an awards ceremony, really? While a return of a Roth-fronted Van Halen has been one of most significant missing pillars in the house of recent rock history, the thunderous, triumphant evening at the Rose Garden this past Saturday night confirmed that the house is now stabilized. Van Halens Eddie, Alex and Wolfgang (Eddie's son installed as bass player and set list architect in favor of Anthony) really made this a family-style affair, and it was undeniably touching at points to see Eddie kneeling/playing next to his son, both experiencing the ecstasy of playing beloved songs to a worshipful crowd. Though Anthony's inclusion would have made this reunion complete, the kid was alright, plucking his bass and harmonizing with his old man at least as well as the erstwhile bassist. Meanwhile, Alex attacked his kit with typical hyperactive force, complete with those signature drum fills and double-bass drum wallop. And what more can you say about Eddie? Trim, shirtless, doing scissor kicks, smiling, and clearly juiced by the deafening ovation of the crowd, his guitar work is just as accomplished and exhilarating as when his band dropped their debut album three decades ago. And then there's Roth. It's surreal to see him onstage alongside Eddie and Alex again, and even he clearly recognizes the headiness of it all. With an above-the-shoulders physicality that should earn him the title of "Rock's Bobble Head," not to mention an open mouth, toothy grin firmly affixed to his face throughout, rock's famous joker was clearly having as much of a blast as the audience. Despite a short haircut that might not be god-given, a slightly stiffer back that nonetheless allowed plenty of fairly acrobatic leg kicks, he delivered on more cylinders than anyone might have expected. Even though Roth retains his slightly disappointing habit of omitting words and phrases from lyrics that are of biblical significance to fans, his enthusiasm and unbridled joy made up for it. The quartet started slightly tentatively with a workmanlike "You Really Got Me," and didn't seem to hit stride until the surprising fourth number, the Women and Children First deep cut "Romeo Delight." 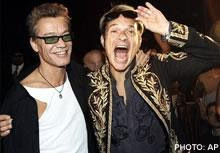 It was at this point that Van Halen began to reveal the fist-pumping, serious fan-appeasing pleasures to come; while riff-laden anthems like "Unchained" and "Panama" got the expected attention, hearing relative obscurities and hidden catalog gems such as Diver Down's sentimental "Little Guitars," the wacky "Everybody Wants Some," "And the Cradle Will Rock" (complete with its squalling, death-from-above guitar intro), and the haunting "Little Dreamer" was what made this night an essential, long overdue pilgrimage for the faithful. Throughout, the instrumentation was airtight, with Eddie's fingers still nimbly dancing around his fret board and Alex and Wolfgang ably holding down the bottom end. For his part, the strutting Roth was hugely entertaining and proved himself the most qualified captain of this ship (sorry, Gary Cherone). One of many highlights was when he stood solo at center stage and played "Ice Cream Man" on an acoustic, complete with a verbose story as to how the tune came to be. It was an intimate moment, but Roth didn't get much time alone, as the band fell in soon enough to perform the electric segment of the song. It was a rare space of calm and quiet, and if there's a criticism to be levied at this two-hour program, it's the sheer breathlessness of it all; given the history and storytelling potential with these guys, a brief song intro here or there, or a chat with the audience, would be a nice way to break up the proceedings. And hey, Eddie – do you talk at all? The burning question now is, what is next for Eddie, Alex, Wolfgang and Dave? If Eddie finally broke down and did this tour to bring his life's work full circle and end it all on a high note, his legacy, always towering, is far more burnished than it was say, a year ago. But if they do press on and do a new album, they have their work cut out for them. However, given the musical force, familial love and glory-reclaimed elation on display at the Rose Garden, it's still not a good bet to count Van Halen out. Whatever they decide to do, the hopes of countless fans have been realized in one of the most surprising and needed rock reunions of recent years.